In a medium bowl, cream together the butter and sugars. Add in the eggs, one at a time. Then add the vanilla. In a separate bowl, combine the flour, baking soda, salt, cinnamon, and nutmeg. Stir into the creamed butter and sugar. 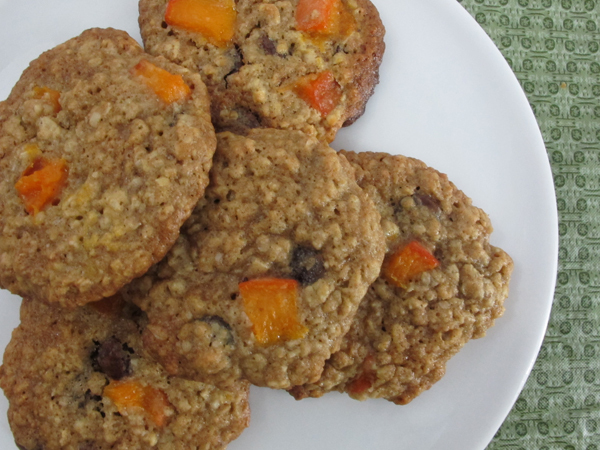 Mix in the oats, then the chocolate chips, and then the apricots. Drop dough onto cookie sheet in rounded tablespoons about 2 inches apart. Allow to cool for 5 minutes before transferring to a wire cooling rack. Note: If you prefer fluffier cookies, chill the dough in the refrigerator for at least an hour before baking.